You already know that car shopping outside of your area can give you more leverage for negotiations, but may not know that dealers in specific regions will sometimes get extra money to move inventory. Finding these extra discounts isn’t always easy, but the extra work can pay off. There are basically two types of discounts that can be applied to a new vehicle. The first is a dealer discount, in which the dealer decides how much profit they are willing to give up on that particular unit. For example, if a car costs $30,000 and the dealer offers it to you for $27,500, their dealer discount is $2,500. The second area of savings is in manufacturer rebates and incentives. If the automaker is also offering $1,500 in customer cash on that $30,000 car, your total savings should be $4,000—the $2,500 dealer discount and the $1,500 rebate. Some dealers will try to convince you that the manufacturer rebate is the only discount available, and this usually is not the case so it’s important to know where that money is coming from. While comparing dealer discounts is a fairly straightforward process, when it comes to rebates and incentives things can get really confusing for buyers. Often dealers will advertise online prices with every rebate possible, most of which you won’t qualify for, to make it look like they have the lowest price. This is why you should always take advertised prices with a grain of salt. Sometimes there are rebates available that are region specific that could put some money in your pocket, but it depends on how they are applied and not every brand uses regional rebates the same way. Recently, I was shopping for a Toyota Tacoma on behalf of a customer in New Jersey. As expected the dealers in the New York metro area were not terribly competitive, and most came back with a discount of around $2,000 off the MSRP. When I widened the dragnet to dealerships in Pennsylvania, not only did one of those stores offer a much better discount of $2,800 off, but Toyota was giving dealers in that particular region and additional $500 customer cash on all new Tacomas. The New Jersey dealers didn’t have access to this rebate, so by taking a short drive, the customer was able to save a total of $3,300 off a new Tacoma. Not bad. That scenario worked out for the Tacoma buyer because Toyota applies the rebate to the area where the car is being sold and not where the customer is coming from. Most domestic automakers apply these regional rebates based on the customer’s location regardless of where they buy the car. When I was shopping for a Ford Explorer for a customer in Illinois, the reverse happened. On that Explorer deal, I noticed that the prices in the St. Louis metro area were quite a bit cheaper than the deals that were local to my client. Since he had family in St. Louis, he said he wouldn’t mind the drive if it meant saving some money. 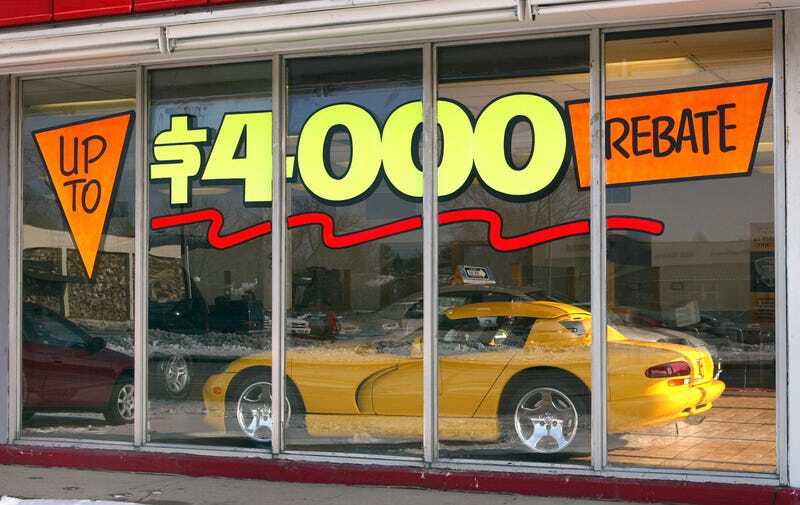 While the St. Louis Ford dealer was incredibly helpful in wanting to make a deal, once they entered the customer’s address into the system it turned out that about $2,000 worth of rebates would not be applied because those discounts were only available to customers from that area. With that extra $2,000 out of the equation, he was better off buying something nearby. So how do you figure out which regional rebates apply to you? The first thing you should do when you are shopping for your next car is to go to the automaker’s website and look up the “local offers” by your zip code. If you’ve ever wondered what that’s for, it’s this. Some brands will even apply those regional discounts in addition to other rebates to the “net price” of the car when you build it on the configurator. Once you know what rebates are available, you should always spread your shopping net a bit beyond your local area because some dealers may have extra savings they can pass on to you. However, when you get your quotes, make sure the dealer is calculating the total cost based on your location and confirm that the discounts would apply. You wouldn’t want to take a long drive only for the price to jump up.